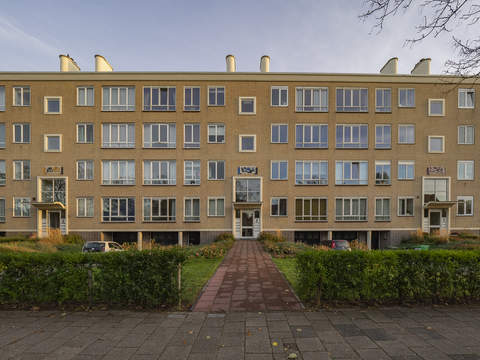 Stokroosstraat 169 Price asked € 265.000 k.k. 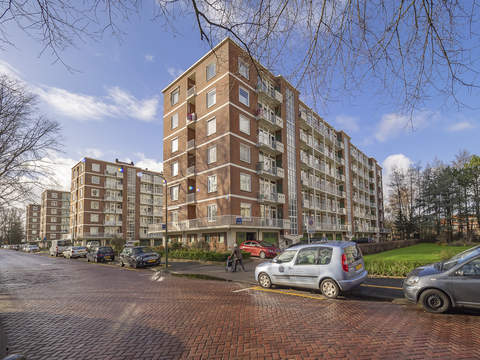 Very attractive and spacious 4-room apartment located on the first floor with unobstructed views of the Stokroosveld. Beautiful kitchen, front and back balcony, separate bicycle storage at the back of the building and a storage room in the basement. The complex is equipped with a lift. Via well maintained closed porch via lift or stairs to first floor. Entrance, u-shaped hall, meter cupboard, toilet with hand basin. L-shaped living / dining room approx. 6.88 x 5.65 partly 2.84 with door to front balcony approx. 2.85 x 1.10 (facing southwest) and sliding separation with glass-stained sliding doors with 4 built in cupboards, kitchen approx. 5.60 x 3.28 with various equipment and access to back balcony approx. 4.40 x 1.30 (facing northeast) with storage cupboard and sun screen. Bedroom with laundry room with washing machine connection and access to balcony. Spacious back bedroom approx. 5.75 x 4.64 with door to back balcony. Neat bathroom approx. 1.90 x 1.60 with walk-in shower, washbasin and radiator. Private bicycle storage approx. 2.22 x 1.42 at the back of the building and a storage room approx. 3.52 x 1.55 in the basement. Situated on lease-hold land, ending at 31 December 2027. The rent charge is € 73.50 per year. Real estate tax 2017 € 109.84 per year. 272/1.953rd share in the community. Active Owners Association, contribution € 141,-- each month. Hot water supply by geyser (rented at Eneco, € 14.79 per month). The apartment has synthetic and aluminum window frames with double glazing. Living surface approx. 99 m². The volume of the apartment approx. 296 m³. Close to shops at the Savornin Lohman Square Goudsbloemlaan, Vlierboom- and Appelstraat, Centre. Boulevard of Kijkduin, “Bosjes van Pex” and cycling distance of dunes, beach and sea! Public transport (Randstad Rail line 3, bus 24), main roads through Westland Road.